One way to decide on your NLP training and trainer is to explore each of the following questions, and then check your own thoughts, feelings and intuition as to their importance. We’re happy to talk you through these criteria in more detail. Get in touch if you would like to try our NLP training free of charge. 1. Does your trainer help you think through what you want from your NLP training? Consider 3-4 areas where, if you made progress, you would feel you had benefited from the course. This gives you a personal measure of how useful the training has been. These 3-4 areas don’t need to be massive changes, and if you’re not sure what to choose, pick anything. It’s likely that those outcomes will change during the training: some you’ll solve and some you’ll realise don’t need to be solved. Curiously we’ve found that if people choose a small number of objectives, not only do they move forward on those, but they progress on other challenges and opportunities that they had not thought consciously about at the time. We consider this makes such a difference to the value you receive from your training that we’ll give you two 50-minute NLP sessions to help you think it through. 2. Do you know anyone who trained with that trainer before? Most people attend NLP training because they know someone who has significantly benefited from a previous training course. What was their feedback? 3. What accreditation does the trainer offer? There are many competing accreditation bodies. We strongly recommend training accredited by either of the two co-founders of NLP: Richard Bandler and John Grinder. This is because they both have developed their training and approach significantly over the years, keeping their NLP training current, fresh, and extremely effective. 4. How many people are on the NLP course? NLP Training courses can vary from several hundreds of people to 1:1 training. The experience and outcome can be very different depending upon the size of the course. In a large training course, it can be like being in an amphitheatre cheering with the audience. In a small training you’re the one on stage performing. The first is fun and you’ll meets lots of really interesting people, however if your focus is on your own learning and personal development the second method is likely to have greater impact. 5. 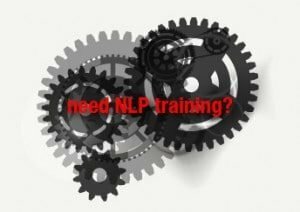 Should NLP training be local or somewhere different? Local training can be cheaper in both time and money, and it may be easier for you to find the space in your diary if you don’t have to allow for travelling and so forth. However, the best NLP training experiences are when you are able to involve yourself fully in the experience. It can be easier to do this if you are in a different environment, away from the pulls of your everyday life. 6. Is the best NLP training modular or intensive? Some courses are continuous, others are split into modules. Our experience is that continuous courses are better for the trainers and modular ones better for the delegates as they have a chance to put their learning into practice during the interval between modules. However in a competitive business environment, if you’re in a position to commit to the time and investment, and the dates of a continuous course work, we suggest you take it! 7. Are you comfortable with your trainer? Its far easier to access and explore different states, ideas and beliefs if you have a good level of rapport and trust with your trainer. Our free NLP Taster sessions will help you decide if you will be comfortable working with us. 8. Are you going to learn and have fun, almost whatever happens? Once you’ve made your own mind up are you committed to learn the most you can and enjoy what ever happens? The people who make the most profound changes to their lives after NLP training are the ones who are brave enough to immerse themselves fully in every experience the training offers.